The 164th Madrid derby between fierce city rivals, Atletico Madrid and Real Madrid, taking place at the Wanda Metropolitano today will be broadcast live on GOtv. The La Liga encounter, which will be broadcast on SuperSport Select 4 (channel 34) at 4:15 pm, is exclusive to GOtv MAX subscribers. The two giants are meeting for the second time this season. The first encounter at Real’s Santiago Bernabéu in September ended goalless. Two points separate the teams, with Atletico occupying the second position on the LaLiga standings with 44 points, while Real are third with 42 points. Real could, however, leapfrog their neighbors should they win and put themselves five points behind leaders, Barcelona, with whom they played a 1-1 draw on Wednesday in the Copa del Rey semi-final. Real Madrid striker Karim Benzema has hit form right in time for the Los Blancos, as they won their last five games in all competitions before Wednesday’s draw. Also posting impressive performances for Santiago Solari’s side is the Brazilian wonderkid, Vinicius Jnr. Atletico’s title chase suffered a blip on the back of a series of draws and a defeat to Real Betis in their last outing. However, they are usually a different proposition at their Wanda Metropolitano home. Coach Diego Simeone will rely on goal machine and World Cup winner, Antoine Griezmann; and goalkeeper Jan Oblak among other stars. A lot of attention will also be Alvaro Morata, recently acquired on loan from Chelsea. Subscribers who upgrade to the GOtv MAX package will have access to the Madrid derby, other games of the La Liga, Serie A, select matches of the UEFA Champions League and English Premier League. Speaking on the Madrid derby, Martin Mabutho, Chief Customer Officer, MultiChoice Nigeria, said GOtv is pleased to broadcast such a major game to its customers across the country. 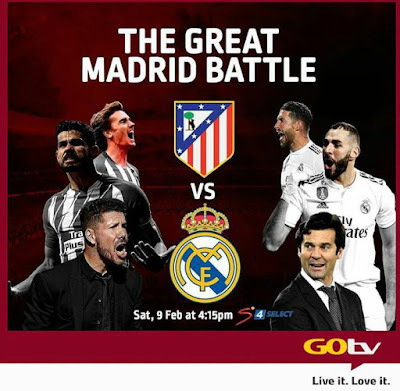 “Being the home of La Liga, GOtv is delighted to showcase live to all our customers one of the biggest derbies in the world, the Madrid derby. With both teams having massive followership in the country, fans of both clubs are guaranteed to enjoy the very best of the game’s coverage on GOtv MAX,” he said. GOtv customers, especially those on GOtv Plus, Value and Lite packages, can take advantage of the “GOtv Top-Up” campaign offer and upgrade to GOtv MAX by paying a reduced fee of N2, 500 to enjoy the best Spanish and Italian football games and other world class programming.